An “ I Will” screen in New York’s Times Square captured attention with submissions for 9/11 Day. The annual 9/11 Day campaign, an event meant to encourage Americans to perform charitable service on each anniversary of the 2001 terror attacks, began in Times Square Thursday with a flood of pledges from people promising to do good works. The pledges, made both in person and online, appeared on the campaign’s website and on giant video screens in the heart of New York City. But first, they were routed through a modest office in Cambridge’s Central Square, where employees at local tech outfit Aerva Inc. collected, screened, and transmitted the thousands of personal statements. Aerva makes tools to filter and curate submitted photos and text for public displays such as electronic billboards. 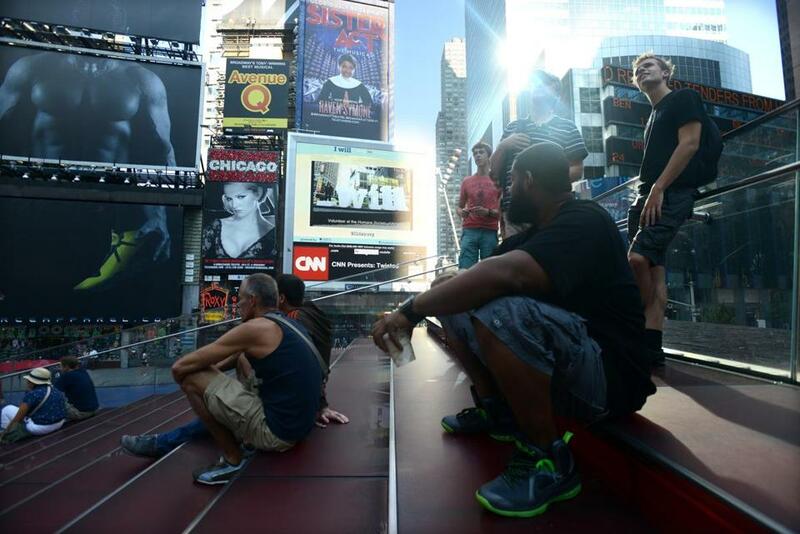 The technology is already in use in Times Square, where human operators use it to manage a flood of cellphone snapshots sent by consumers for display on a digital billboard sponsored by Kodak. Thursday’s event launched an outreach campaign that will continue until Sept. 11, to allow time for organizers to plan service projects and recruit volunteers. On Thursday, users were able to send in photos and simple pledges, each beginning with the phrase, “I will . . .” via e-mail or Twitter. In Times Square, more than 300 people lined up to stand on a 30-foot sculpture that spelled out “_ will”, completing the phrase by forming an “I” with their bodies. Their pictures and pledges were sent into the campaign feed. At the same time, Aerva employees in Cambridge sifted through the deluge of images and text, using the company’s software to review each submission. Once approved, images were sent back to Times Square, where they were displayed on two video billboards. This is the second year that Aerva has donated its resources to the project, which is organized by MyGoodDeed, a nonprofit group founded after 9/11. MyGoodDeed, which is based in Newport Beach, Calif., led the campaign to have Sept. 11 designated by Congress as a national day of service, a goal that was achieved in 2009. Last year, about 33 million people participated in some form of charity on Sept. 11, making it the largest-ever day of service in the country’s history, according to MyGoodDeed. The nonprofit has an annual budget of around $1 million, and relied on about $14 million in donated services for its outreach campaign. Radio giant Clear Channel Communications Inc. and clothier American Eagle Outfitters each supplied the use of a billboard in Times Square for Thursday’s event, and television networks ABC, Fox, and NBC pledged air time for public service announcements. Before Aerva marketing manager Jeannette Hon screened 9/11 Day submissions last year, she was concerned that the process might be painful or emotional, but those fears were unfounded, she said. Last year’s 9/11 Day campaign generated more than 100,000 pledges, pictures, and stories, according to MyGoodDeed. On that day, the group added 45,000 fans to its Facebook page. Numbers for Thursday’s event were not immediately available.